Downloader is a download manager that helps you to download files from a remote server via FileTP/BT/Donkey and stores them directly on your network drive. To use this application, you must first enable the downloader service. For more details, see Preferences > Downloader. Add Add the URL address of a new file to download. Upload Upload a new BT torrent file. Start Start downloading the selected task(s). Pause Pause the selected task(s). Clear Delete the selected task(s). Info Show more detailed information about the selected task. Downloaded Open the download folder in the file explorer to see the downloaded files. Seeded Open the download folder in the file explorer to see the seeded torrent files. Refresh Refresh the task list. On the left hand side in the downloader window under Transfers, you can select one of the categories in order to filter the current tasks and better manage your downloads in the task list. Downloading Displays files that are currently being downloaded. Queued Displays tasks that are waiting in the queue to be downloaded. 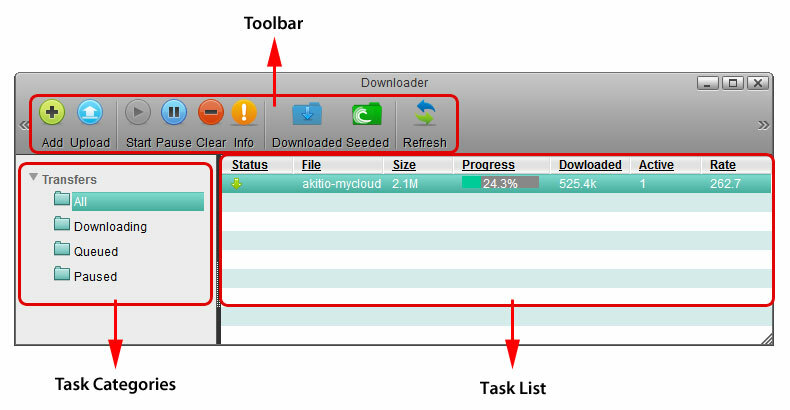 On the right hand side in the downloader window, the task list displays the basic information and status about each task. Network Identifies the current network connection. 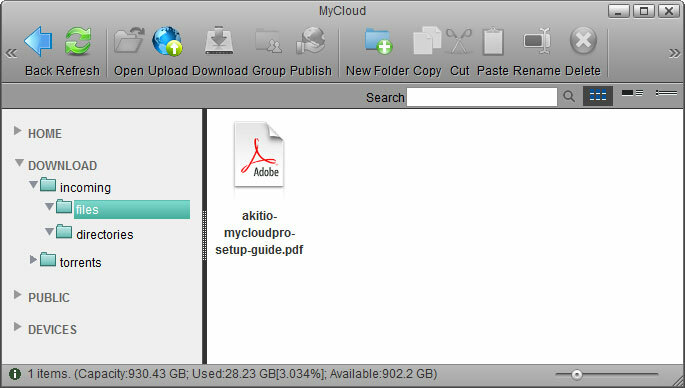 File Shows the file name. Size Shows the total file size. Progress Shows the current progress of the download. Click Refresh to update the progress. Downloaded Shows the amount that has already been downloaded. Comments Shows the comments for the file download. Sources Shows the total number of sources for the download. Active Shows the number of active sources for the download. Avail Shows the number of available sources for the download. Age Shows the total time that the download has remained in the task list. Last Shows the downloading time that the task has lasted. Rate Shows the current download rate of the file. ETA Shows the estimated amount of time remaining until the file is downloaded. Priority Click the drop-down menu to select a priority for each task from the list of available priorities. Click Refresh to update the status and see if your download is working. Locate the torrent file (*.torrent) that you have previously downloaded to your computer and drag it on top of the upload window. Select the task that you would like to manage in the task list to highlight it. To select multiple tasks, hold down the control (Ctrl) key and then select your files. To select a whole range of tasks, select the first task, hold down the shift (Shift) key and then select the last task. Click on one of the available commands in the toolbar. To view more detailed information about a certain task, select the task in the task list and click Info. Network Shows the protocol that the network address belongs to. Downloaded/Size Shows how many bytes have been downloaded. Priority Shows the priority of the task. User Shows the current user of the network drive. Group Shows the name of the group. Strategy Shows the download strategy that is used. Sources Shows the number of sources for the task. Chunks Shows the number of chunks. Chunk Size Shows the total size of chunks. The above table only shows FileTP relevant information. For torrent or mldonkey tasks, the information shown here will be different and based on the corresponding protocols. The following table identifies the fields shown in the Peers tab. Num Shows the number of peer host(s). Name Shows the name of the peer host. IP Address Shows the IP address of the peer host. Client Software Shows the client software. Upload Shows the amount that has been uploaded. Download Shows the amount that has been downloaded. In the file explorer window, open the Files directory. Click Refresh to see your downloaded files. 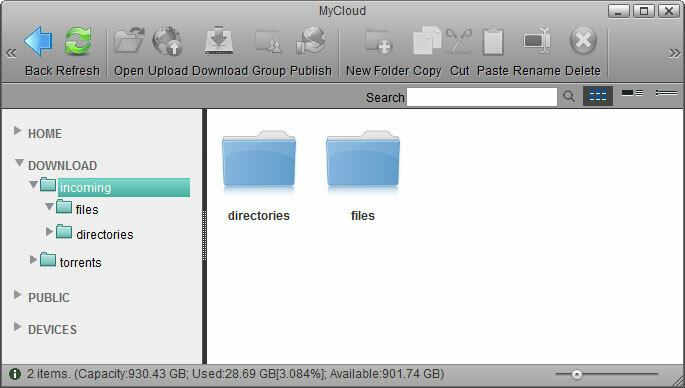 From here, you can move the files(s) to your HOME directory or download them to your computer.